Area Ambassador Directory - Welcome to your next great ride. Local routes from local experts. 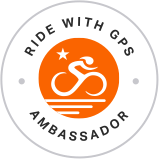 Ride with GPS Ambassadors share the hidden gems from their locations, creating a global directory of high quality, vetted routes. Devoted to high mountain adventure by bike, challenging climbs to lesser known peaks and buttes. Roads, trails and wanderlust. Bike adventures off the beaten path. Be Happy, Be Healthy, Make a Difference. Explore the Historic Triangle on two wheels! Beautiful rides on every surface, for every experience level. Exploring the roads of southwest Ohio. Central Oregon bicycle tour operator and bike shop. Road biking in the Red River Gorge and surrounding area. Seeking quiet and beauty in the Southern Oregon and Northern California outback. The best roads — and backroads — in the Portland region. Big rides. Hard races. Remote places. Travel. Ride Bikes. Do Good. Getting people stoked on cycling... & gravel, always a little gravel. Cyclist accommodation and bike rental. If you're too busy to ride, you're too busy! Discover South Africa’s top cycling destinations & adventures. Epic Backcountry Rides...and some easier and fun ones! No specialty ride road and mountain. I wouldn't have believed desert canyons, arid buttes, rolling rangeland, alpine mountain ridges, lush forests & scenic river valleys could all be crammed into a ride less than 100 miles long prior to exploring this little known part of Oregon. The South Fork John Day River & Aldrich Mountain Range are often overlooked gems in this sleepy corner of Oregon. ... Did I mention there are two rentable backcountry Forest Service Cabins along the way?